Jalaibi.com is a local initiative which hopes to add a positive dimension to the current narrative about Pakistan available on different media platforms. We are a small team of four who felt that not enough positive stories are being reported about our country. This is largely because there are only a handful of people talking about the real Pakistan, and the content is being hosted on media channels, which are driven by a ratings market that focuses on negativity. We thought that maybe the best way to get the whole story out there was to ensure that the whole population could contribute to that story and thus, jalaibi.com was born. Since this is an attempt to balance the existing narrative, we started by creating a platform and then sourcing good content to curate. Our attempt to make this happen is through a series of workshops, which will be held nationwide. The target audience will be largely the under-represented online populations, which include senior citizens and minority communities. We will introduce them to the world of citizen journalism and blogging, in the hopes that they will start talking about their side of the story – which could be anything. The only requirement is that the stories must represent a positive aspect of their lives. 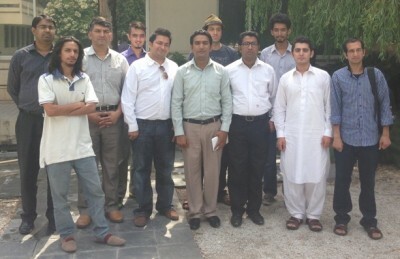 We have conducted the inaugural workshop in Islamabad. The biggest challenge here was contacting the target population, to ensure their inclusion as trainees. The workshop itself was very successful. We brought together 10 eager young people, and introduced them to the world of citizen journalism. Our workshop covered journalism, blogging with WordPress, and internet security, as well as capacity building with social media, and the monetization of blogs. Our main takeaway from this session was that the participants seemed much more interested when we were actually talking about the concept of citizen journalism and how to start blogging with the various tools we displayed. This will form the main theme of our next workshops. Unfortunately, many female participants felt they could not attend the workshop due to travel and other restrictions. We would also like to add live streaming to jalaibi.com, which will enable them to learn from the safety of their own home, as well as some marginalized communities who have issues with movement as well. While we received some great feedback from the participants following the workshop, we are yet to receive any blog posts from them. This will remain a challenge as we take this project forward. Currently, we call the participants on a weekly basis reminding them of their commitment to the blog site. We have also created an email list through which we stay in touch with all the participants in the hopes that we can slowly galvanize them into writing for us or other platforms to raise their voices. As a further sign of initial success: 4 out of the 10 attendees did vouch to write consistently for Jalaibi in the near future. We hope the next training round is an even better success! You can stay up to date with jalaibi.com on their Facebook page. All images republished with permission. Well done keep it up ! Hey! Great initiative. I’d love to help if you guys need any. Shoot me an email and lets get in touch. Keep up the good work!